Sarah commissioned a bespoke engagement ring for Lou which was designed as a surprise for her. To give Sarah the same special experience, Lou got in touch to start talking about design ideas. She wanted to incorporate blue and white stones within the design to reciprocate the colour combination in her own engagement ring. At the centre of this 9 carat white gold engagement ring is a 0.34ct princess cut AAA grade aquamarine which Lou selected from our collection to reflect Sarah's love of geometric shapes. A 1.5mm princess cut diamond has been set on either side of the central stone to add extra sparkle. As a final nod to Lou's ring, a combination of hammered white gold and palladium has been used to perfect the special design. 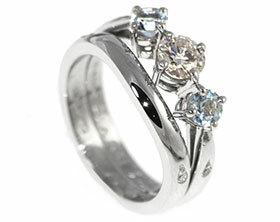 Platinum and aquamarine engagement ring with 4 channel set diamonds.